Not everyone has access to plantable land, so container gardening is a great way to enjoy fresh, healthy produce all summer long! Growing produce in pots is perfect for where I’m currently at in life. It’s more manageable since there’s hardly any need to pull weeds and there’s no need to till the land. The only maintenance is regular watering! Not only does container gardening save space, it saves money as well. Something that is important with the cost of food forever increasing! While I’m not an expert, there are some tips I’ve learned that I’d love to share, to help you get started with container gardening. The first year I decided to try my hand at container gardening, I went a bit crazy. Rather than trying out a couple of different plants, I decided to try almost every plant that claimed to be especially for small spaces. As the summer went on, I lost my enthusiasm and most of the plants ended up being neglected. I’ve since learned to assess where I’m at in life to determine just how much time I’ll have to maintain my garden, which helps me decide how many plants/seeds to buy. Container or urban gardening is becoming quite popular these days. It’s quite easy to find plant and seed varieties that are produced especially for growing in compact situations. In fact, I picked up a couple of different seeds that were from an “Urban Garden Collection” line of seeds by Thompson & Morgan. For the types of plants that do best in containers, see my post The Best Vegetables for Container Gardening. Don’t think you have to spend a lot of money to build up a container collection. In fact, I got all my pots (black 5 gallon buckets that trees or big shrubs come in) from the golf course that I work at. I didn’t pay a cent! While this is not an option for most of you, many greenhouses sell 5 gallon tree buckets at an affordable price. You could also keep your eyes open on sites like Kijiji, Craigslist or Facebook buy & sell sites for any suitable container. These Grow Bags are also great! In choosing the size of your pots, take a look at the packages or labels on the plants that you have purchased. If they’re especially meant for containers, the packages or labels will usually tell you if you need a big pot or if a small one will suffice. Tomatoes, beans, peas, carrots, potatoes, and peppers generally need large containers, while lettuce, radishes, herbs, and onions are suitable for shallower containers. When determining where to put your containers, sunlight is a very important thing to factor in. Most vegetables need a lot of sunlight so I placed most of my containers on our back patio where they get all the afternoon sun. I put my lettuce containers in the front where the morning sun only hits for a couple of hours;lettuce doesn’t like to get too hot. Your seed packs and plant labels will tell you how much sun each plant prefers. Once your containers are in place, you’ll want to fill them with a good quality potting soil. Not top soil and not regular garden soil. Potting soil is always modified to ensure proper drainage and aeration which is important to the health of your plants. Filling large containers can be costly. To reduce the cost and also the weight of the container consider adding a filler to the bottom of the container to take up space. Crushed pop cans, plastic milk jugs, packing peanuts and even those empty black/green plastic flower pots you just used are all great options. Finally, it’s time to plant your seeds or starter plants! Plant each fruit and vegetable according to the directions found on the label or packaging. Water everything well. (You may want to use a spray bottle for little seeds, like lettuce, so they don’t get washed away.) Now, sit back and watch for everything to start growing! Throughout the Summer, I’ll be doing regular updates on the progress of my container garden, unless it’s an utter failure! Have you ever done any container gardening? What will you be planting this year? of it?!! To me it’s infuriating !!!!!!!!!!!!! out to fast or are not loose enough and get packed down. also basil and oregano I do well with peppers in containers also. it is nice to have close to the kitchen. and need to clip basil and oregano into it. 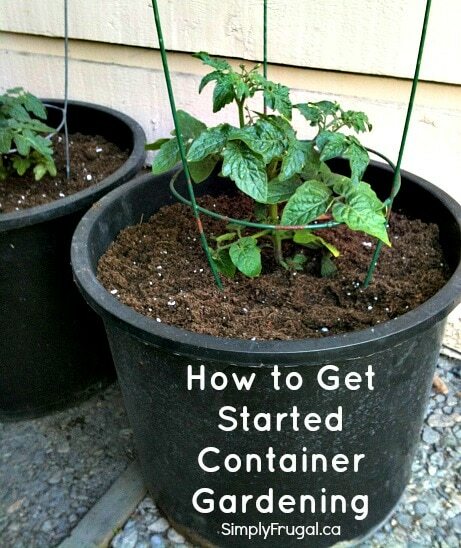 so this is helpful, use you containers even if you have a garden. bacth of soil every year and turn the old into the compost pile . good luck every one. just have fun. I just started my own urban garden this year, using mostly pots too. We planted two tomatoes that are tolerant to our weather, plus lettuce and zucchini using containers we already had in the yard. I can’t WAIT for the plants to start producing fruit. I think the biggest hurdle of gardening is getting over how “hard” or the “wrong” circumstances we might be in. There is ALWAYS something for everyone to grow. Whether it be inside or out, fruit or veggie or herb – just growing something!! and basil, both with great success. . Dark coloured pots and clay pots are not recommended for container gardening because the dark coloured pots heat up too quick and can cook the roots of your plants or dry out the soil too quickly, clay pots dry out too quickly as well.